Veg. 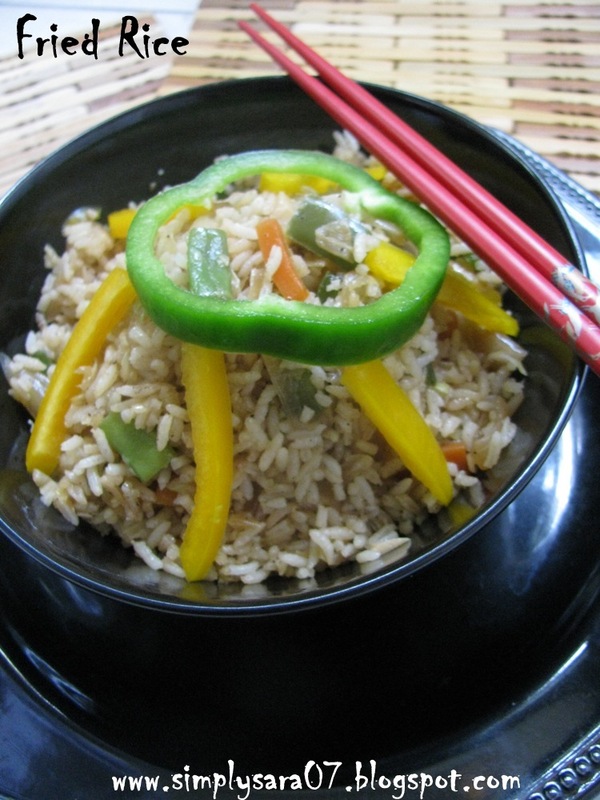 Fried Rice is a chinese dish but very famous in India. I had taken snaps last time when I prepared but was so lazy kept on pending to post. Today, I prepared this for lunch and took new snaps of it. Me and my friends enjoy eating in Shanthi Sagar, Bangalore which is a fast food. Rice - 2 cups(Steamed)Basmati Rice tastes good. Heat a wide wok/kadai, add oil, onion, ginger garlic a pinch of salt and saute till transperant. Add carrot and beans. Saute for 1min. Add all sauces, ajinomoto and saute till its half cooked. 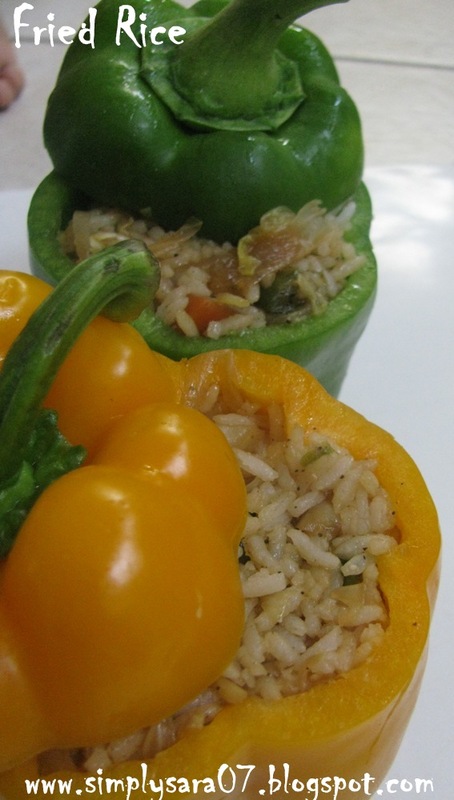 Notes - If you use white pepper, the colour of the rice will be white. If you use black pepper, the colour of rice will change to slightly dark. healthy veg. fried rice.... i love adding capsicum....nice presentation! wonderful n great lloking tempting fried rice sara...looks awesome n bful presented too.. Awesome and beautiful looking fried rice..
fried rice looks awesome....nice presentation!! Delicious fried rice. Looks fantastic! Yeah i agree tht chinese food is very popular in india...this rice luks droolworthy n the presentation is gr8. Looks really yummy n appetizing..love this chinese dish anytime..
Nice recipe, lovely presentation with the bell pepper! All time fav rice..nice presetation in those edible cups.. Thank you friends for lovely comments. I like the way this one is being prepared. Very lovely and so pretty! I want to try this one out.